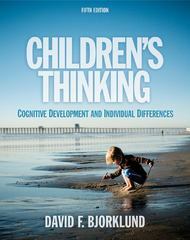 Children's Thinking 5 Edition A comprehensive book supported by extensive research studies and data, Bjorklund's text presents the broadest coverage of topics in cognitive development. Unlike other books, Bjorklund shows readers how developmental function can help explain individual differences in cognition by covering both the typical pattern of change in thinking observed over time and the individual differences in children's thinking in infancy and childhood. A major theme of this book is the continuous transaction between the embodied child embedded in a social world: although a child is born prepared to make some sense of the world, his or her mind is also shaped by forces in the physical and social environment.